Editor’s Note: The Parliament of the World’s Religions, which takes place every three years, was held November 1–7 in Toronto, Canada. The Urantia Book booth was staffed by many readers from Canada, the United States, and elsewhere. Two booth volunteers share their comments. I was told that some 72 Urantia Book readers were present at this event. I guess they all passed by our booth at some point in time, but I did lose count of them all throughout the happening. I’m sure that this was because I was too busy just appreciating the numerous smiling faces of the people present, passers-by, and the many I encountered and fraternized with in this huge Metro Toronto Convention Centre. I enjoyed the contact of their open and seeking souls; people were thirsty for world peace! This message was particularly felt within the global call for unity that was highlighted within presentations and plenaries (at least in the ones I recalled attending, although there were too many for me to recount them all!). What particularly hit me, though, was this interfaith phenomenon that is experiencing growth globally. There is an increasing willingness to collaborate. People of all faiths are gathering here and there on Urantia to foster joint-venture projects on behalf of social progress. This is quite encouraging! The Most Highs can only delight in such happenings—as they rule in the kingdoms of men (and women of course). As in previous events such as this prestigious one, Urantia organizations were faithfully supportive in co-sponsoring the costs inherent to our lovely Urantia Book booth. And as Canadians, we were honored by the presence of all who contributed by participating in person. As a participant at the Parliament of the World’s Religions 2018, I found myself reflecting on a mind simulation of what it might feel like to be at a future Urantia conference where 7,500 personalities were in attendance. “The Promise of Inclusion, the Power of Love” was this year’s theme. The single most compelling experience I had was observing the unity that was shared in religious diversity, there being over two hundred of the world’s great religions represented at the conference. 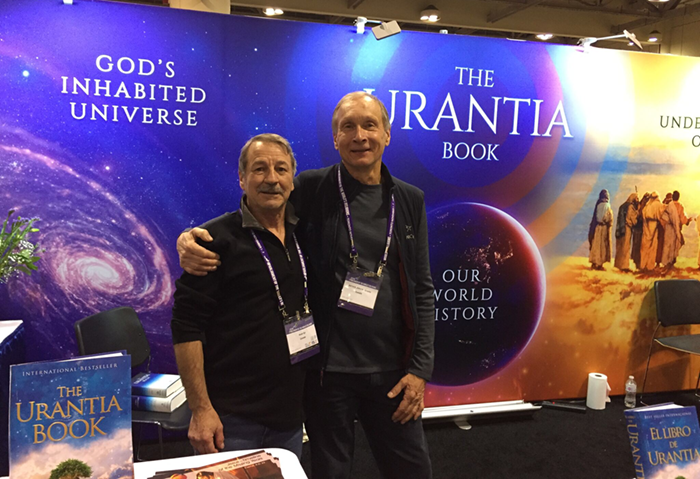 At the Urantia Book booth, 72 comrades endlessly took turns sharing our understanding of true religion with individuals passing by, including many discussions on the ideals of truth, beauty, and goodness. I believe that most came away with good thoughts about what was said of the teachings in The Urantia Book. I heard a few people say that they had heard of the book; some of them picked up printed information or bought one of the books. The Parliament’s program schedule was filled with events almost beyond count, all pursuing understanding, reconciliation, and global transformation. The next Parliament of the World’s Religions will be in three years, dates and place yet to be announced. I would encourage the Urantia community at large to attend the event, which may be a highlight of their lifetime, an opportunity to experience this dynamic, service-motivated, worldwide interfaith movement. So it went for seven days under one roof—getting to know one another’s beliefs about God, our Universal Father, and building a harmonious foundation for a more peaceful and friendlier worldwide interfaith community with His mortal sons and daughters.